Services for Alberta J. (Hall) Faught, 88, of Mentor, will be at 10 a.m. on Friday, March 21, 2014 at The First Church of Christ, 422 Mentor Avenue, Painesville. 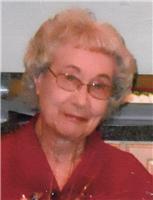 Alberta passed away Tuesday, March 18, 2014 at Heartland of Mentor. Born May 5, 1925 in Byesville, she has lived in Mentor for the past 45 years. She was a member of The First Church of Christ in Painesville, an avid Skip-Bo player and loved to make people smile. Alberta was employed in the food service department at Mentor Public Schools, retiring in 1983 after 14 years of service. Survivors are her children, Beth (Curt) Kelly of Eastlake and David Faught of Mentor; grandchildren, Lauren Kelly of Mentor and Gregory Kelly of Eastlake. She also leaves many nieces and nephews and their families and her great-grand cat, Franklin. She was preceded in death by her husband of 58 years, William A. Faught, on January 21, 2010. Her parents, Howard and Sarah Elizabeth (Gill) Hall and siblings, Carl, Eugene, Opal, Pat and Dortha are also deceased. The family will receive friends from 4 to 8 p.m. on Thursday, March 20, 2014 at Davis-Babcock Funeral Home, 4154 Clark Avenue, Willoughby. Final resting place will be in Western Reserve Memorial Gardens, Chester Township. In lieu of flowers, the family encourages contributions to The First Church of Christ, 422 Mentor Avenue, Painesville, OH 44077. Please share your memories of Alberta.